Forum Index > Historical Arms Talk > Purpose of "S-curve" guard? Posted: Wed 22 Dec, 2010 9:35 pm Post subject: Purpose of "S-curve" guard? I recently noticed Hanwei's Mercenary sword with an S-curved guard. What was the purpose (if any) for curving a guard instead of keeping the quillons straight? Did it somehow help bind an opponent's blade better? Just wondering. KOA seems to have a good price on it. An S curve was thought to provide an improved defense against cuts, at least according to a couple sword sites. Curved quillons seem to start popping up in the late 14th century, as shields fall from common usage. Could just be a fashion statement, YMMV. For a right hander, a long cross that curves like an S viewed blade-to-handle is less likely to jab into the wrist. Conversely, when using a long straight cross, I find it necessary to bend the wrist out in ceertain guard positions to avoid same. A parry sliding down the flats of a blade when the sword has a strait guard can easily hit the hands since the guard will be bypassed and give no protection. With curved ends one can have some protection to the hands if one hasn't the guard oriented in a way to intercept the opponents blade. Side rings also do the same and probably do a better job of it but this curving of the ends seems to have been a popular and early solution to the above ways one's guard can fail to protect the hands. Anyway, in practising longsword with a strait guard one does have to pay careful attention to the angle of one's guard in parries or play at the sword and curved ends on a guard also makes snipping at the hands more difficult. I don't buy into any of the theories that the s-curve is done for functional reasons. I've trained with both straight and s-curved guards, and there is no practical difference. As far as I'm concerend, it is 100% cosmetic. I don't dispute your greater experience here but in bouts or practice I have had swords hit my hands ( Not hard because of control by opponent ) when I made a mistake and had my swords guard at the wrong angle to intercept a blade sliding down to my strong and beyond to my hands. I'm just guessing about the functionality of the guard ends but I'm " imagining " that the curved ends could " save your bacon "
even by accident since the curved ends should probably not be used deliberately or counted on this way. I have this Del Tin and it is just too tempting to try and see a use for the curved ends. On a rapier, I find the S curve quillons are one way of making a quillon bind more effective, but not the only one. If the quillons are straight, your opponent's blade will pop right out of the bind, off the end of the quillon. The bend will hold it in place, allowing you to apply more counterpressure between the blade and the quillon. However, a knob at the end of the quillon or similar other decoration can perform the same function. The lower arm has the same function on a bind under your blade on the right, but this is a more difficult bind and the bend has to be placed correctly to be of any assistance. Both bends are more effective for this purpose if they are slightly twisted so the upper quillon points slightly right and the lower slightly left, which is not an uncommon configuration. I've made a few of these and although I defer to Bill's observation that the curvature might not have much martial implication I think it does matter in carriage. I sometimes see differences in artistic depictions but as far as I can tell most surviving examples curve the same way, which seems unlikely if it's purely about fashion. When the sword is worn on the left side, the typical curvature of these guards has the forward quillon curving in from your left side toward your navel, which takes it out of the path of your left arm. The rear quillon is far enough back on your left side that its outward curve doesn't interfere with the natural motion of the arm. I noticed this apparent standardization (after initially recurving a cross the wrong way) but didn't really appreciate it until I made an historical scabbard and suspension and wore the sword it in an historical manner. This might not be a correct or full explanation for this common cross type, but it's at least practical and helps explain the apparent standardization. Compare the curvature of the cross in the vertical shot with the curvature in the photos. They are pretty. I think so. I have an Earl and from my play with it I get the sense that I can rotate the sword around my wrist and arm a bit more efficiently than I can with other straight cross guard swords that I have. It's more of a sense than something I can quantify, but it's there nonetheless. This comes into play more when switching from a cut with the true edge into a cut from the false edge immediately after. It seems that the guard gives me more "space" in which to turn for the return cut. I train mostly for Italian rather than German longsword so your techniques may vary also. FWIW, this style seems to be especially common on German/Austrian swords. Then again, it could just mean that I'm doing it all wrong! I thought I would resurrect this post as it relates to a query I have. I am new to the group so please accept my apologies for being "ignorant" but you have to start somewhere. Regarding the "S" curved cross. How would you hold the sword? 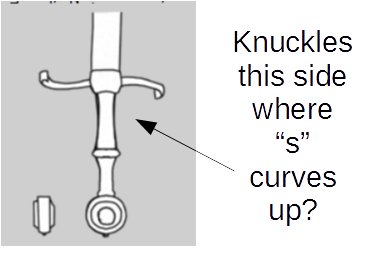 Would your knuckles align with the "s" curve that srolls up to the handle and so the blade would be the same side as that which the s curves up towards the handle? Or do you grip the handle so that your knuckles are the same side as the "s" curve the curves towards the blade? Longswords with s shaped guards like the one pictured don't turn up or down, so it doesn't matter which way you hold it. It might look like it in certain pictures because of the angle of the picture. See the below picture. For swords like rapiers you hold it with the curve towards the grip over your knuckles. On the picture you have posted - yes, it probably is an optical illusion. 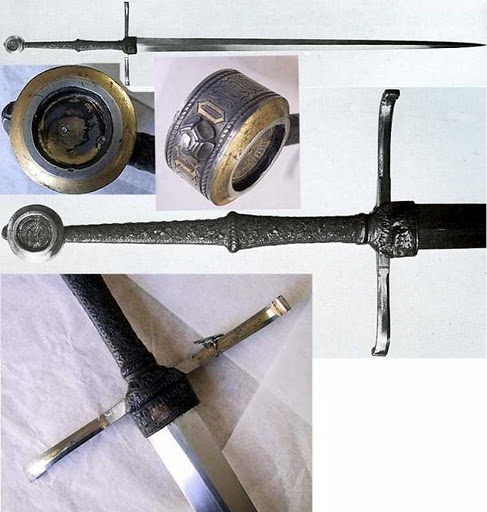 I that case, handling would be probably very much like by similar single-handed sword: the guard bending towards the handle faces your fingers, the one bending towards the blade faces your wrist.